Happy Fat Tuesday! Put those Lenten resolutions of abstinence and chocolate deprivation on hold for one more day. Tomorrow, we fast. Today, we feast! 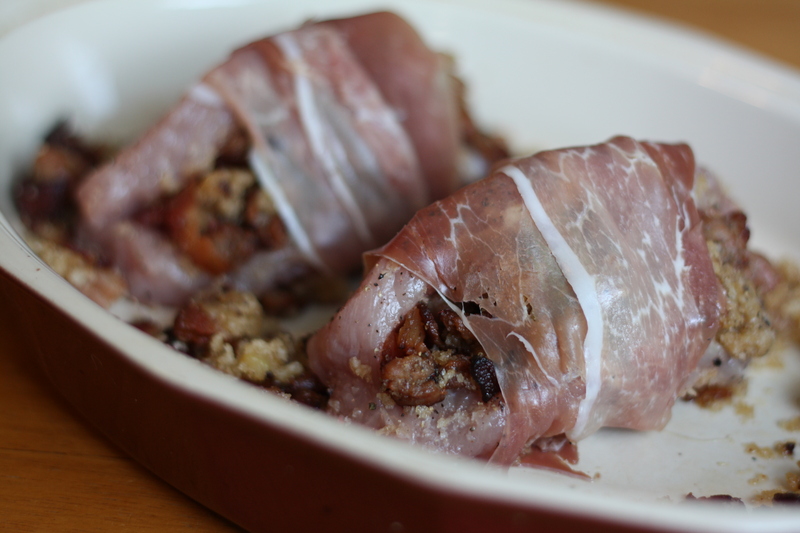 Recently, during a particularly lucid early-morning shower brainstorm, I developed a recipe which is either my most genius creation or proof that I’ve completely gone insane; pork stuffed with pork and pork, wrapped in pork. I’m calling it The Whole Hog. 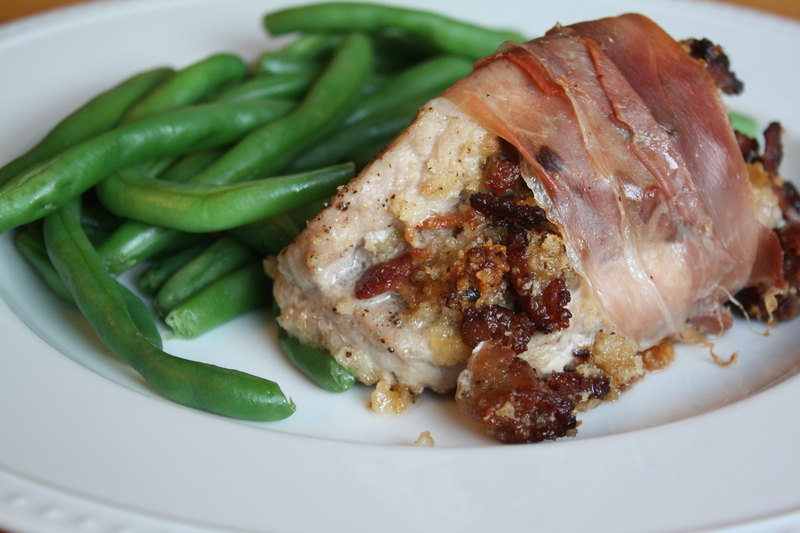 We’ll start with boneless pork chops, then stuff them with a sweet and savory filling made from bacon and sausage, and wrap them in prosciutto for the final touch. This is a dish to send the three little pigs running for the hills. In honor of Fat Tuesday, I proudly present you with The Whole Hog: Pork with Pork, Pork, and Pork. Genius or insane? You decide. Heat butter in a pan over medium heat. 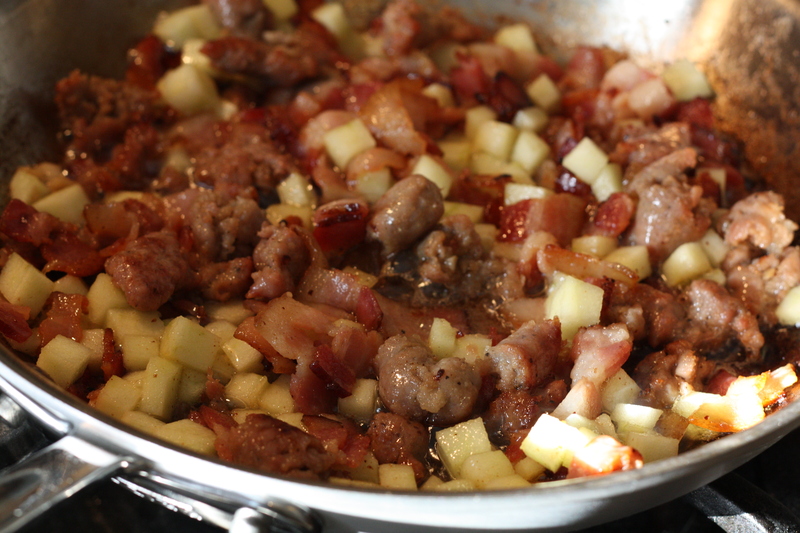 Add the bacon and sausage. 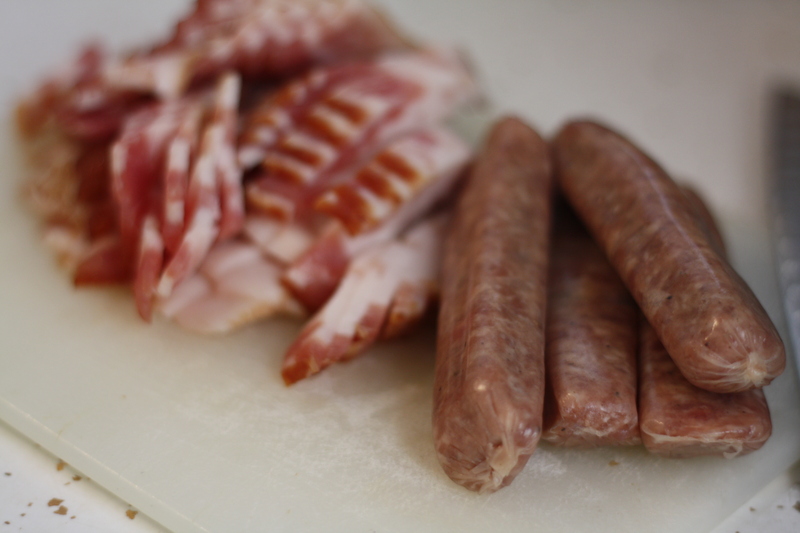 Cook until bacon begins to crisp and sausage is fully cooked. Use the side of a spoon to break up the sausage as it cooks. Add the apple and cook for a few minutes longer, until softened. Add the panko and stir until the panko crumbs absorb the excess fat and pan juices. Season the stuffing with salt and pepper, as desired. Split each pork chop almost all the way through, to create a pocket for the stuffing. Generously stuff each pork chop with the bacon and sausage mixture. Scatter any extra stuffing on the bottom of a baking dish. Place the pork chops on top of the extra stuffing. Season the outside of the pork chops with salt and pepper. Wrap each pork chop with prosciutto. Bake for about 20-25 minutes or until fully cooked. Posted in Food, Main Course, Pork, Recipes and tagged bacon, Cooking, fat tuesday, Food, holidays, lent, mardi gras, pork, Recipes, sausage. Bookmark the permalink. Wow! I think this looks crazy good – and the pork chop is fairly lean, so it sounds more sinful that what it actually is. Happy Mardi Gras! Wow that is a lot of pork! haha, looks really great though! Can’t go wrong with pork, pork and more pork. My kind of recipe! Absolutely genius! I score this 20 out of 10!